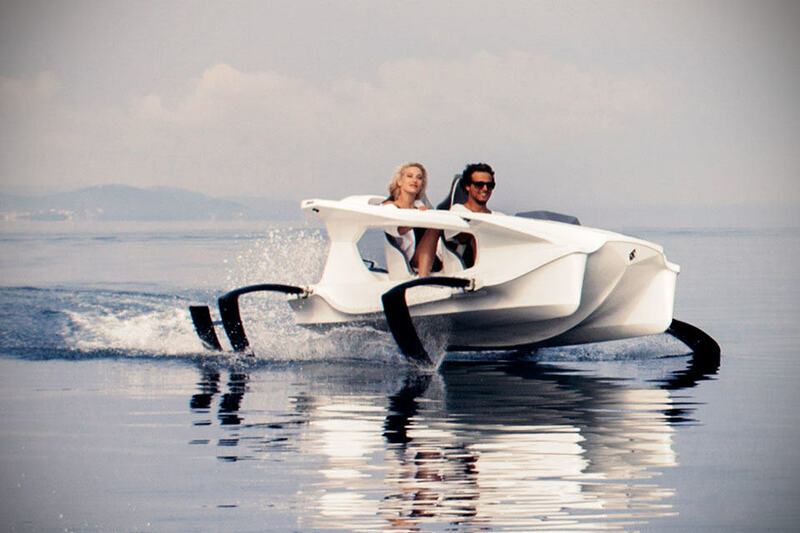 Powerboats or speedboats have long been regarded as the sports car of the open water, but there is a new kid on the block that wants usurp this status quo and its name is Quadrofoil, an electric hydrofoil personal watercraft. 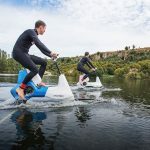 Hydrofoil, though rare, is not the newest new, but to find hydrofoil as a compact 2-seater personal watercraft is something of a news and sure sounds pretty exciting, and even more so when you know how much it cost. But we will come to that later. 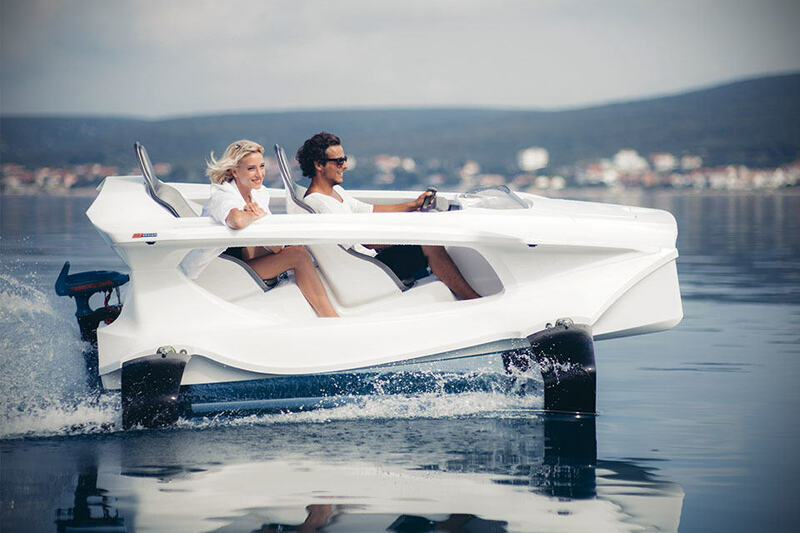 Power comes from a custom developed electric outboard motor which together with the c-foil technology enables the vessel to rise above the surface, thereby allowing you to ‘fly’ over water. 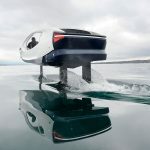 It sports a unique, aerodynamic form and since it ‘flies’ over water with only the struts (aka foils) are in contact with the water, it minimizes the drag thus allowing the Quadrofoil to cruise up to 40 km/h (21 knots) and achieve an impressive range of 100 km (62 miles) per two-hour charge. In addition to being virtually silence and emission-free, Quadrofoil will neither leave huge wakes nor create waves, which means it could go where its gas-guzzling cousins can’t like lakes, rivers, seas and even eco-zones where motorized boats and PWC are strictly prohibited. 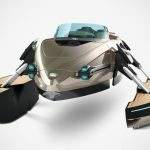 It has a patented steering system that doubles as a stabilization system, affording the maneuverability while preventing drifting. Another noteworthy mention is its minimalist cockpit, which basically has one major component: the steering wheel. The steering wheel is where you will find the controls, namely accelerator and braking function, and it also boast an integrated touchscreen monitor that displays all the essential information such as battery status, range and speed. The steering wheel is also the key to your hydrofoil, which without, the watercraft cannot be started. 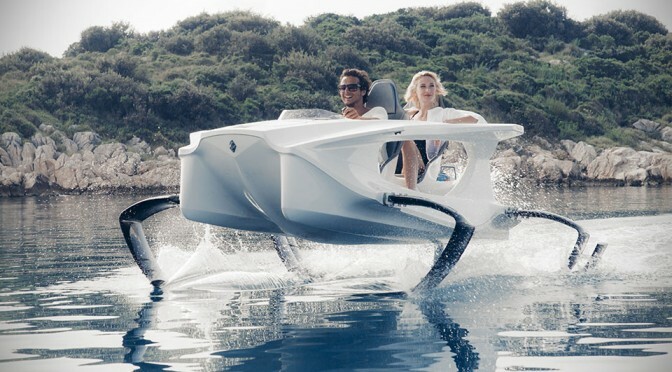 Quadrofoil has a watertight, modular hollow hull made of Glass-reinforced Plastic (GRP) which tips the scale at a mere 100 kilograms (220 lbs, sans engine, foils, and batteries) and is built to absorb impact forces in the event of a collision, while the deck is outfitted with a pair of ergonomic, upholstered sport seats for a comfy ride. 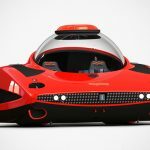 Two models are being offered, an entry level Q2A and a premium Q2S, differentiated by the level of equipment, motor type and battery capacity. Whichever you choose, each Quadrofoil comes standard with two life jackets, a paddle, as well as a safety whistle. So much much for this recreational marine transportation? Surprisingly, prices start at just €15,000 for the Q2A, and 22,500 euros for the Q2S. The latter has a limited production run and will be delivered sometime in March 2015. The Q2A on the other hand, is slated to be shipped in Q2 2015. 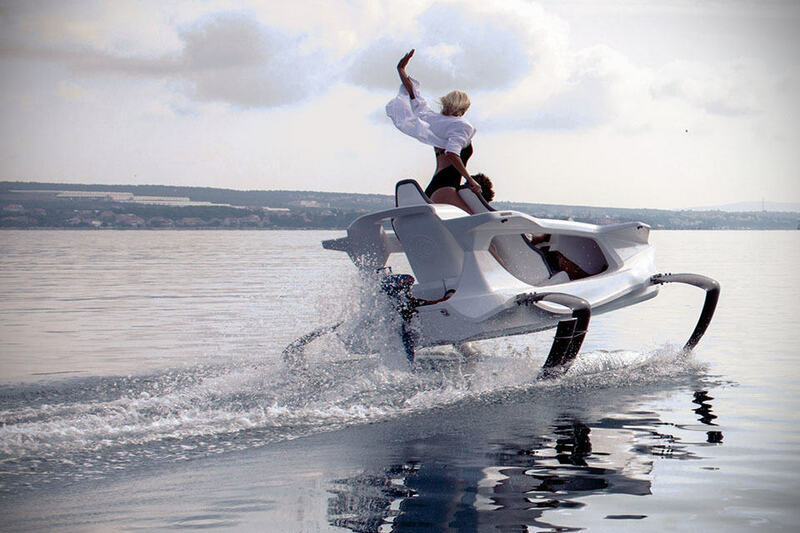 Keep going for a video of the Quadrofoil Electric Hydrofoil Personal Watercraft in action.